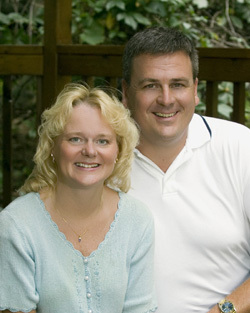 Jon and Krista Smith founded Sonset Point Ministries in 2008 due to a passion in their hearts to help others heal from the pain of loss and brokenness. We both personally have experienced the pain of divorce and walked through the single parenting stage over 15 years ago. Through this we have experienced this painful journey and have reached the other end where there is grace, peace and happiness again. When dreams are shattered many choose to find wholeness through many worldly alternatives. Our passion is to use our experience and what we have learned over the past 20 years to share God’s perfect plan for healing to all the members of your family. In June of 2012, Jon unexpectedly went home to be with his Father in Heaven. It is because of the passion that we shared that I am continuing down this journey of bringing hope and healing to the brokenhearted. So it is for his honor and appreciation that I dedicate this ministry to my husband, my best friend and love of my life, Jon Michael Smith. Sonset Point Ministries provides God’s hope and healing to all members of broken families as they seek restoration and healing. 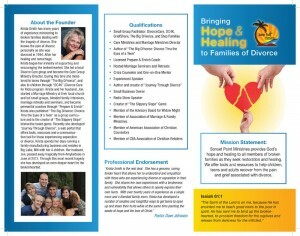 We offer tools and resources to help children, teens and adults recover from the pain and grief associated with divorce. For more information, visit www.sonsetpointministries.com.